Can we use first-person pronouns in our writing? Yes. 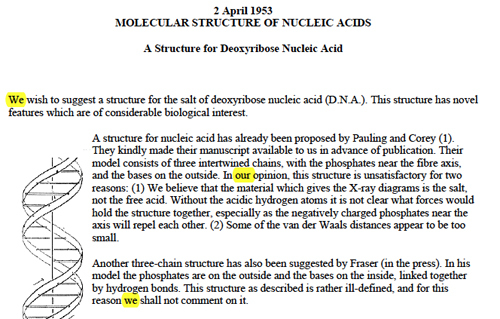 Watson, J. D., & Crick, F. H. C. (1953) A structure for deoxyribose nucleic acid (DNA). Nature 171, 737–738. Section #227: MW 9:40-11:10 a.m. Section #228: MW 11:20-12:50 p.m.